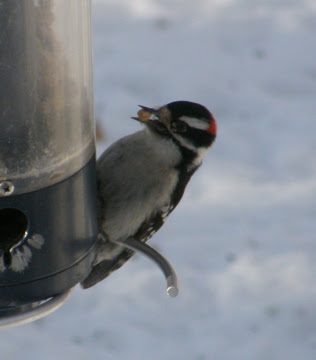 What's the Difference Between a Hairy and Downy Woodpecker? When people I meet are just getting into birding they sometimes ask me about the difference between Hairy and Downy Woodpeckers. If you look in a field guide they seem virtually identical. The main difference is that Hairy Woodpeckers are bigger than Downy Woodpeckers. The silly way I kept the names straight when I was starting out was that you have hair on the top of your head which is up high and makes you big so the bigger woodpecker is the Hairy and the Downy is down low and smaller. If the two birds are kindly sitting side by side it is easy to tell them apart. If you have a good feeding station with lots of suet then you do sometimes see them side by side. However, this is not always the case and people get confused. The problem is compounded when looking through binoculars as it is hard to get a size reference. Everything looks big though binoculars. Now-a-days I can tell in an instant which is which because I see them so often. Here are some tips for those who are still unsure and need to know what they are looking at. Look at the beak of the bird in the photo above. It is relatively long and has a stout strong look to it. Compare that beak to the one in the photo below. You can see in comparison, the beak on the bird above seems dainty. It is slender and pointy like delicate tweezers. 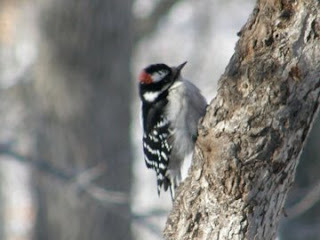 This is the smaller Downy Woodpecker while the first photo with the much thicker beak is the Hairy Woodpecker. There are a few other subtle differences but I find that the beak is a good way to tell these two apart. Once you see enough of them on various trees you'll simply get a feel for how big the bird should look and you'll be able to tell at a glance which species you are looking at. Test yourself below. Which photo shows which species? That's all for today. Since woodpeckers are some of the most conspicuous visitors to the feeders this time of year I'll be back later this week with more posts about woodpeckers.